Some of you may have your Easter day menu and to-do list organized on a spread sheet. You set your table yesterday, and fresh polished silver gleams atop ironed linen napkins, which coordinate stylishly with your china and the fresh flower centerpiece you will arrange on Saturday. I admire your efficiency, and looking about my grease-filmed kitchen, would be thrilled to know your secrets. But the following recipe is for the rest of us; a consolation prize for those of us with dining room tables cluttered with year-end tax documents and drooping plants in the window begging to be watered. A recipe for those of us who don’t have it together, and who shudder at the thought of cooking a fancy meal after a morning of exhausting Easter hoop-la, who just want to pull something out of the fridge we made the day before — and not spend much time even fussing over that. Would it be too much to ask that this recipe be festive, with ingredients suggesting spring; that the dish could be made a day in advance; that it pair well with ham or lamb, our traditional Easter favorites, and also stand in as both a starch and vegetable? And, just one final request, is it too much to ask that the dish also taste delicious? I present to you a recipe that satisfies all the above criteria, a recipe you can take to the bank. An upscale brunch-type of a casserole that may be made 24 hours in advance to baking; a dish that will satisfy a discriminating palate, but not leave behind a sink of dirty dishes. This, my friends, is a recipe to fall in love with — if only I could take credit for its genius. There is a bit of advance planning: The bread should be 1-2 days old. Sawing through slightly stale artisan bread, however, can wield a nasty cut, so I cut the bread into cubes after purchasing it, then returned it to its original bag for 24 hours. I love the rich flavors of wild mushrooms and Gruyere but if you’d prefer a less complex flavor profile, substitute Swiss cheese for the Gruyere and button mushrooms for the wild mushrooms. We’re coming into our own Michigan morel and asparagus seasons in a few weeks, and I’d imagine the casserole would be scrumptious using these local treasures. I found the recipe in the cookbook, “Hands-Off Cooking: Low Supervision High Flavor Meals for Busy People”, by Ann Martin Rolke. My changes to the original recipe are as follows: I covered the casserole in foil partway through cooking (otherwise the top would overbrown before the casserole was baked); I used fresh dill instead of dry, garlic instead of shallots and assorted wild mushrooms (I purchased fresh assorted wild mushrooms in a pre-pack from Meijers) instead of oyster mushrooms for a flavor boost, and added an additional 2 ounces of mushrooms to the recipe. In a large bowl, whisk together milk, stock, eggs, dill, garlic,1 teaspoon kosher salt and 1/2 teaspoon freshly ground black pepper. 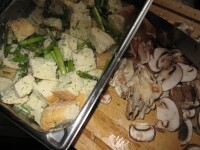 Toss bread cubes into mixture and let saturate all sides of bread cubes. 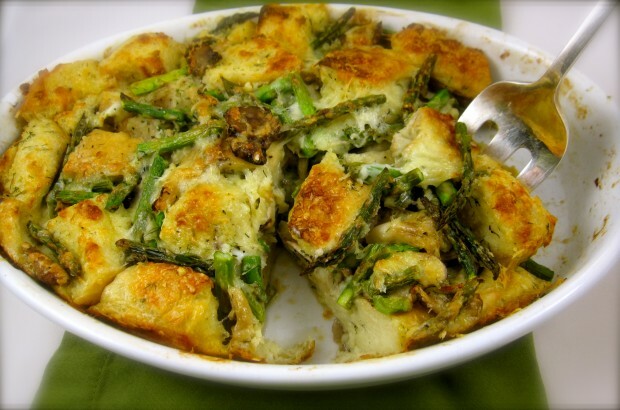 Fold asparagus and mushrooms into the mixture and spread vegetables throughout. Spoon bread mixture into a well-oiled 9×13-inch baking dish or casserole and, with a spatula, pack down. Evenly sprinkle with grated cheese. Cover with a piece of oiled foil, oiled side lightly covering cheese, and place on middle rack of oven. Bake 30 minutes, remove foil, then continue baking until top is golden brown and there is no liquid in the center, 15-20 additional minutes. Let sit 10 minutes before serving. *I separate the tips from the stem pieces and use the attractive tips to top the casserole.